A hand-picked Democratic nominee running in a Pennsylvania special election in March said Monday morning that he wouldn't support Rep. Nancy Pelosi (D., Calif.) if elected. Conor Lamb, running to fill the Pennsylvania seat vacated by Republican Rep. Tim Murphy's resignation, told the local Tribune-Review that the party needs new leadership. Lamb's comments come as a response to Republican attempts to tie him to Pelosi, which has proven to be a successful strategy and has put candidates such as Georgia's Jon Ossoff in a crippling bind. Lamb told the Tribune-Review he has only met Pelosi once in passing and she had no role in his nomination. He also criticized her for her lack of focus on the opioid epidemic and the nation's infrastructure. "I would like to see leadership that gets serious about the heroin epidemic," he said. "So far what we've done is declare it to be a national epidemic. I'd like to see that prioritized. I'd also like to see us get serious about infrastructure." 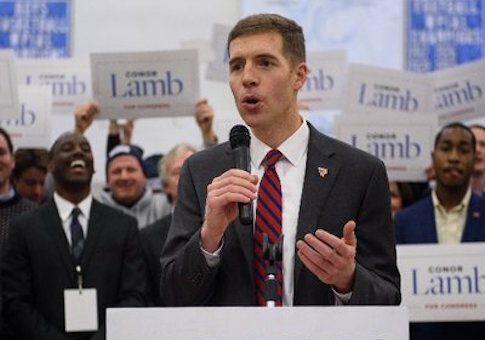 Lamb, just 33 years of age, was selected as the party's nominee not through a primary but by members of the Western Pennsylvania Democrats. He was labeled on the day of his nomination as Pelosi's "handpicked" candidate by Republicans. "The only person Conor Lamb is fooling is himself," Jesse Hunt, a spokesman for the National Republican Congressional Committee, told the Washington Free Beacon. "Nancy Pelosi is House Minority Leader and Lamb will gladly follow her in whatever direction she takes the Democratic caucus." The Democratic Congressional Campaign Committee did not respond to a request for comment on Lamb's attempt to distance himself from Pelosi.